Greg, it’s that time. We betta review Greta. A young woman named Frances (Chloë Grace Moretz) lives in New York City and works as a server in an upscale restaurant. One day while commuting on the subway, she sees an abandoned purse. She decides to return the purse to its owner, much to the dismay of her roommate Erica (Maika Monroe). The purse-owner is a woman named Greta (Isabelle Huppert) who is grateful to Frances, and the two begin to form a friendship. But things take a turn when Frances discovers an array of duplicate handbags in Greta’s cupboard – each with the name and phone number of other girls stuck to the bags. Frances terminates her friendship with Greta. But Greta begins to stalk Frances. Now it’s a cat-and-mouse game as Frances tries to find a way to escape Greta’s unwelcome advances. Greg, Greta is a hybrid movie containing elements of both Fatal Attraction and Misery. We can see Fatal Attraction in the pathological attachment Greta has for Frances, and in Greta’s refusal to let the relationship go. And we can see Misery in Greta’s forced captivity of Frances. Because Greta is actually a terribly bland name for the movie, I’m going to call this film Fatal Misery, or perhaps Miserable Attraction. Both aptly describe what transpires in this story, and I suspect Fatal Misery also describes your experience in the movie theater, Greg. There’s not much to say about this movie other than it is a perfunctory, light-weight thriller. My main problem with the film was with its portrayal of our hero, a young modern woman named Frances. Unfortunately, there is nothing “modern” about her, as she is a sad stereotype of an old-fashioned damsel in distress in her helpless reaction to her situation. 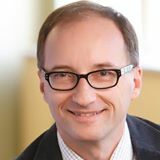 We’ve seen a lot of strong women heroes in the movies in the past year — e.g., Alita, Veronica Rawlings, Ruth Ginsburg, and many more. In Greta, Frances is a weak female lead and reinforces old-time pigeonholing of women as weak and helpless. I would have liked to see her respond more strongly to the bullying that Greta dishes out at her. Her roommate Erica would have been a better badass choice for the lead role and would have been more proactive in handling the creepy stalker. But rather than confront and challenge, Frances whimpers her way through this film and relies on others to save her. This movie is not doing the remediation of current gender stereotypes any good. Scott, I very much enjoy Chloe Grace Moretz in just about anything she does, and Greta is no different. I think Moretz is already a force to be reckoned with in Hollywood and will go on to do great things. 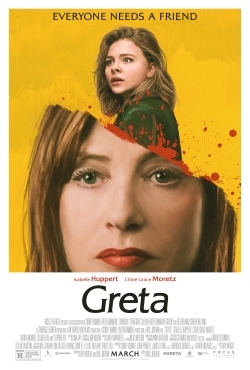 However, her talents are wasted in Greta as it devolves from a taut psychological thriller into a pedestrian horror film (more similar to Halloween than your antecedents). In proper hero’s journeys, the hero is the one who saves the day and vanquishes the villain. And I really thought we were going to see Frances rise up and turn the tables on Greta, but we did not (for a great example of how this should go, see Room). Instead, her father hires a detective who figures it all out, but he’s disposed of by the creepy, but petite Greta. Then her best friend Erica eventually masquerades as a potential victim and saves our hero. Finally, they lock Greta in a box that she may be able to escape from – prepping a possible series of sequels (Greta 2: Greta Returns,Greta 3: Daughter of Greta, and finally Greta 4, The Finale: No ReGretas). And what is it with Hollywood that old people have to be creepy? Remember 2015’s The Visit? Just sayin’. Greta is an average thriller that has some virtues, such as the performances of the cast and a couple of scenes that are delightfully creepy. But Greta suffers from being derivative of past movies, and it shamefully features a woman hero in Frances who has very few heroic traits. Thank goodness her roommate Erica takes the reins and wreaks havoc on the villain. In a good hero story, the hero develops the traits necessary to save herself. For these reasons, I can only give this movie a rating of 2 Reels out of 5. Not surprisingly, I’m going to give our hero a very low rating due to the fact that she represents a step backward by reinforcing negative gender stereotypes. Erica is the true hero of the story, as she takes charge and does what it takes to bring down the enemy. Poor Frances is relegated to the role of the helpless victim and will need years of therapy to recover from the ineffective way she handled her ordeal. There is no hero transformation here, which for me is necessary for a story to be strong or interesting. I give Frances 1 Hero point out of 5. As for the message of the movie, I don’t think it’s that “no act of kindness goes unpunished.” I think the message is – choose badass friends who will save you when you can’t save yourself. Or perhaps the lesson is to be careful about making a complete stranger your best friend. A definite lesson is, don’t run into the basement of a scary house if you’re trying to escape from the house. There’s not a strong or memorable lesson here, except choose your movies more wisely, so all I can muster is a rating of 2 Message points out of 5. I wish I could counter your arguments with logic and compassion – but you’re right on all counts. It’s almost as if someone had a Hitchcockian thriller in hand and at the last minute decided to turn it into a 1980’s slasher film. I think Plan 9 from Outer Space had a more coherent plot. I’m not going to elaborate more than we already have and give the film 2 Reels, 2 Heroes, and 1 Message point out of 5, respectively. And let’s hope this doesn’t put a nail in Chloe Grace Moretz’s career.